Firstly, check out the two pins above. These were worn exclusively by vendors (likely at the stadium) and look modern. Unfortunately, the auction description doesn't provide much background detail about when these were used, etc. Nevertheless, the market thought very highly of them and gave them a final hammer price of $71.39 for the pair. (Auction Link) That's way more than I thought it could be worth. 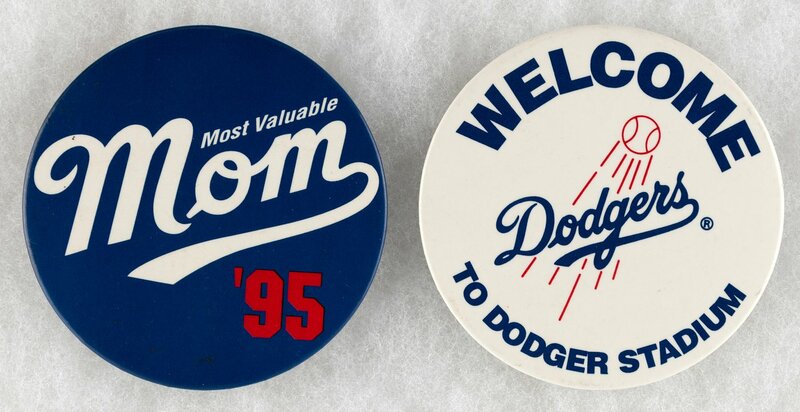 Below are a couple of other modern-looking pins that sold for more than I could imagine. (Auction Link) The pair below sold for $48.03. Wow! Below is a 1997 Clear Lake Heritage Days tribute button honoring Dodger hurler Burliegh Grimes. (Auction Link) Ol' Stubblebeard lived in Clear Lake, WI after his playing days. 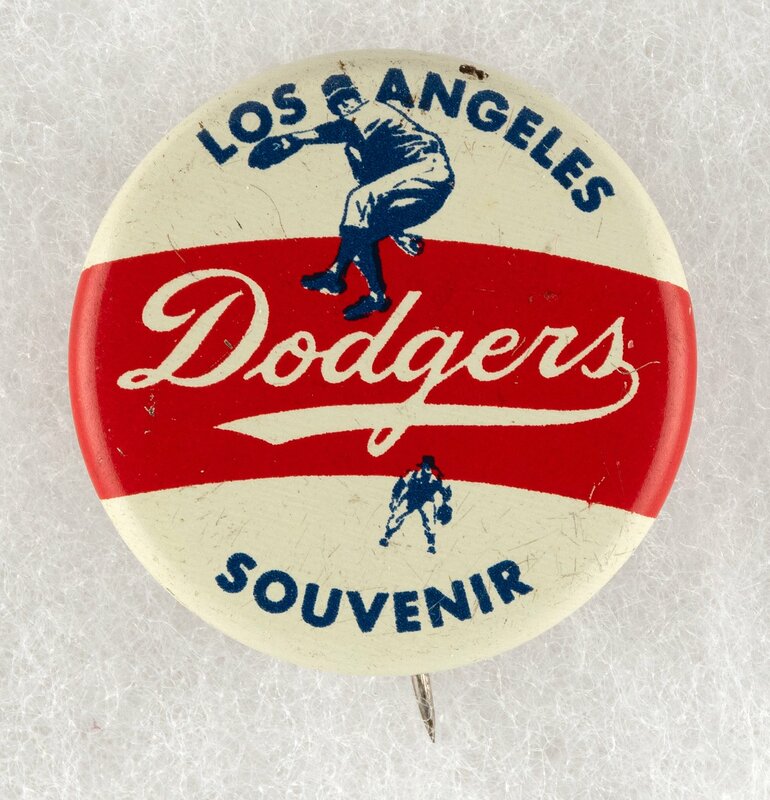 This pin sold for $28.56. 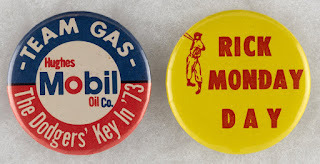 Below are a couple of circa 1970's Dodger pins -- one put out by Mobile Oil in 1973 and a "Rick Monday Day" pin likely from the 1976 season. The latter pin no doubt refers to the day when Rick Monday saved an American flag from being burned on the field. 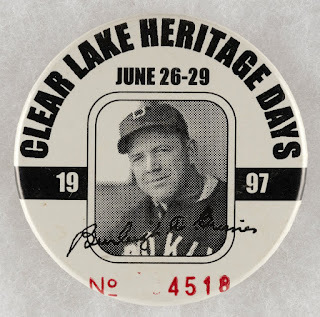 BTW, it is possible that this is actually a Chicago Cubs pin since Monday was a Cub at the time, and I know Chicago actually celebrated a "Rick Monday Day" that season. (Auction Link) These two pins sold for a combined $32.50. 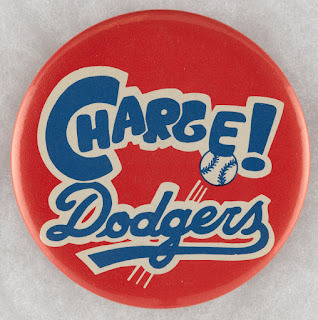 I know I've seen the below "Charge!" pin before. 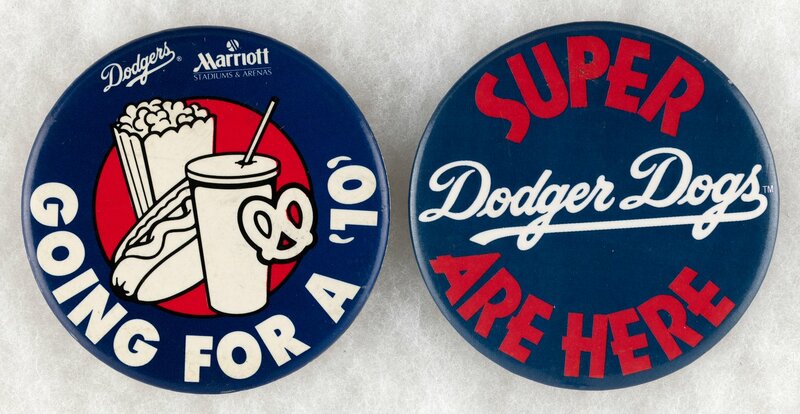 I don't recall, however, if this was something I saw at the concession stand, or if employees wore these at games. (Auction Link) It sold for an impressive $57.11. 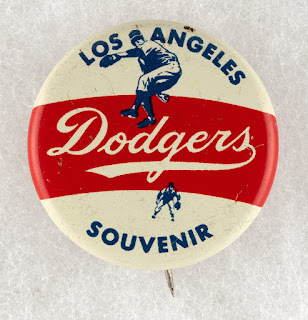 Below is one of the earliest Los Angeles Dodgers pins around. (Auction Link) It sold for a lofty $114.22. 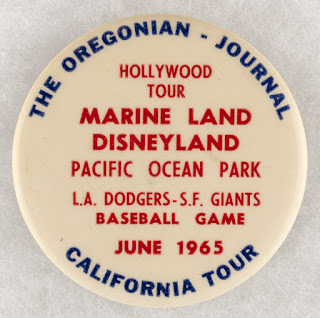 This next pin is also extremely scarce. 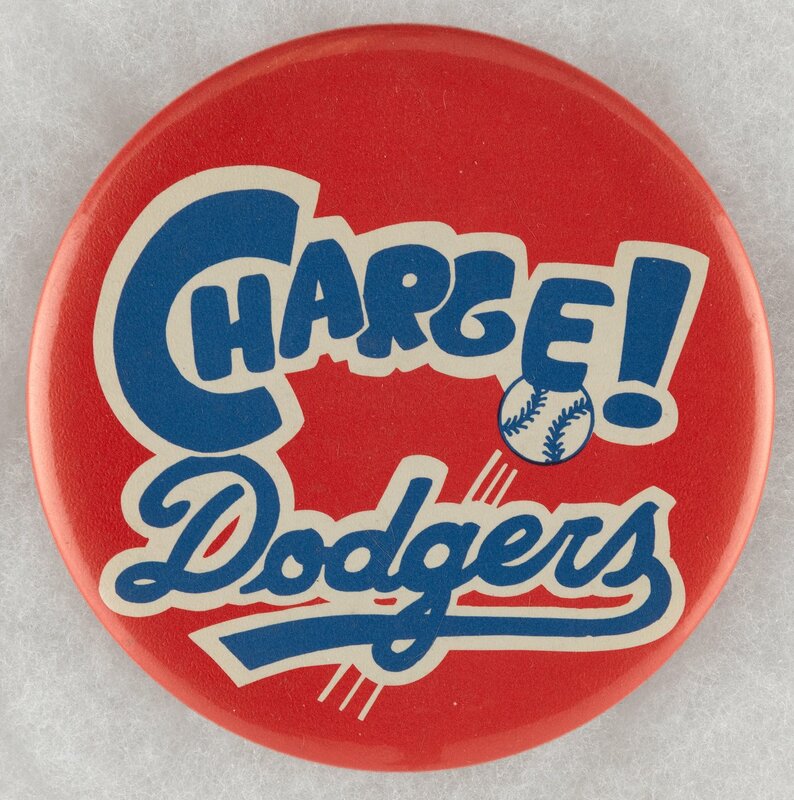 (Auction Link) It sold for an unbelievable $274.94. Wow! 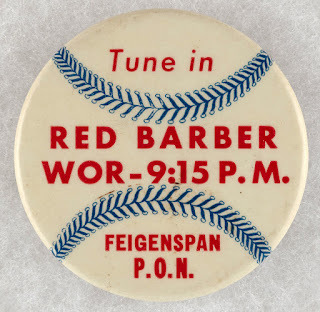 Lastly, the below pin is from the 1940's and it advertises Red Barber's radio show on WOR in New York City. 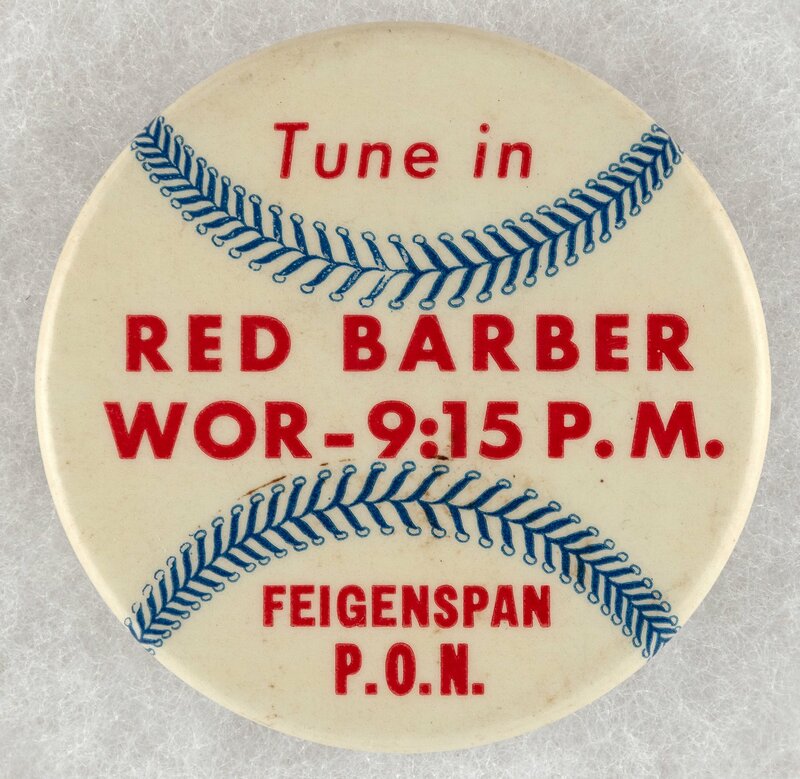 As you know, Barber was the Dodger broadcaster who hired Vin Scully in Brooklyn. 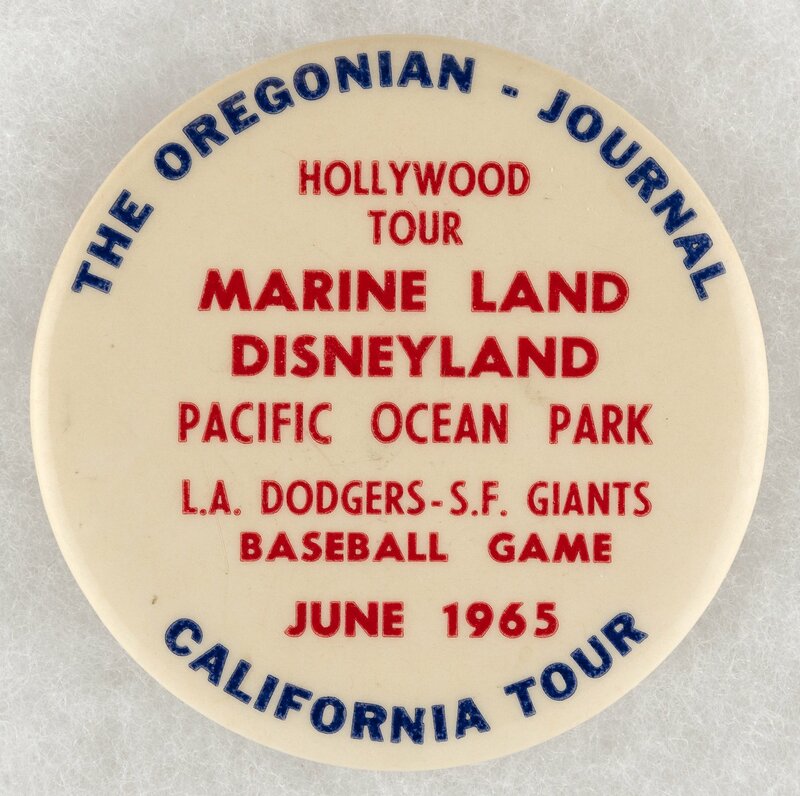 (Auction Link) This sold for $533.48.